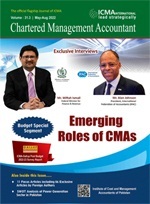 The Institute of Cost and Management Accountants of Pakistan’s Diploma in Islamic finance designed for result of growth of the Islamic banking and financial institutions / industry, there is a continuous critical need for banking / finance professionals, who are grounded in their understanding of the substance and form of Islamic Finance. The Institute offers a complete diploma to fulfill needs of both Islamic and conventional financial institutions providing Islamic banking services and products. It has been designed to provide a professional qualification for commerce graduates, Banking Officers and above to initiate a career in the banking sector and to enhance knowledge. It emphasises on the practical aspects of Islamic banking and finance while providing a fair grounding of the jurisprudential foundations of Islamic banking. . Newcomers to Islamic finance as well as finance professionals seeking accreditation in this vast field. The programme is assessed though a mix of two practically focused home assignments and an end of course exam at ICMA Pakistan, Computer Lab (CBE). Participants must achieve 50% or above in the final exam to be eligible for the award of the Diploma. Pass mark is set at 50% with distinction achieved at 70%. The candidates will be required to undertake a 1.5 hours computer based examination (CBE). The programme is delivered over a series of interactive sessions, based on 12 pillars equals to 3 Months or 45 CPD hrs. While this Diploma is in itself a valuable addition to the participant’s academic records, the CPD hours of this certificate will beneficial them in future. Attendance must be above overall 90%. Upon attending at least 70% classes’ Certificate of Participation’ will be awarded to each participant and CPD hours will be granted according to the actual attendance of participants. Upon completion diploma certificate will be awarded to each participant. However, certificate of participation will be given to each participant for attending 70% classes. PKR 42,000 (excl. of all taxes) applicable to all members of accounting apex bodies. PKR 45,000 (excl. of all taxes) for other participants. Any participant who fails to qualify examination [CBE] may reappear in next schedule examination on payment of Rs. 3,000/- to get the Diploma Completion Certificate. Orientation Session on Wednesday, March 06, 2019 at 6pm at ICMA Pakistan Head Office, ST-18/C, ICMAP Avenue, Block - 6, Gulshan-e-Iqbal, Karachi, Pakistan Karachi. The number of participants is limited in order to ensure a high quality level of the programme. 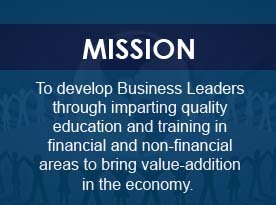 ICMA Pakistan, ST-18/C, ICMAP Avenue, Block - 6, Gulshan-e-Iqbal, Karachi, Pakistan.